Inside Out is one of our favorite movies (we are both big Disney fans and little kids at heart). I’m a pretty happy, peppy person, and my husband LOVES Lewis Black (the voice of “Anger” from the movie). 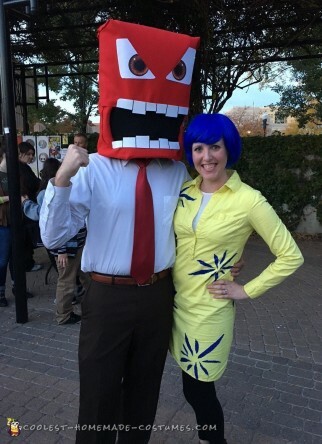 So making Inside Out costumes seemed like a no-brainer. I also had seen a similar costume at a party last year. After talking to the women who had made theirs, I knew I could replicate and possibly out-do what they’d done. I’ve definitely never been so proud of a costume (or any craft I’ve done before!). The “Anger” head was made with 2 inch craft foam, rolled into a cylinder, glued together with hot glue. I cut another piece of foam to be shaped like a house (square on one end, triangular on the other end) and glued it to the inside of the top of the cylinder so it had a lid (the triangular side served as the shape for the eyebrows). Once the foam frame was together, I cut out a rounded rectangle for the mouth. Then I hot glued red felt to the foam frame, making sure to wrap the felt so it covered the inside of the rounded rectangle mouth to give him lips. After the felt, I glued two layers of black cheesecloth to the inside of the mouth so he could look through it. Then I cut out two rows of foam teeth, drew demarcation lines between the teeth with a Sharpie, and glued them on with tacky fabric glue. The eyes came from a photo of the “Anger” character, printed on card stock, cut out, and glued on with tacky fabric glue. While I was making the costume, the hot gluing SUCKED. My husband was watching a frustrating football game while I was working on this, so there were angry yells from him after poor plays. As well as angry screeches from me from burning my hands and fingers. Overall not a great night, but the end result (for me at least) was worth it! I learned way too late that Aleene’s Tacky Glue is a MUCH better (and less blistery) way to go when gluing the felt to the foam. The rest of his costume was easy and basically what he would wear to work on any given day. Red tie, white shirt, brown pants, brown shoes. My dress was purchased at a thrift store. I cut out the star burst pieces from blue sequin fabric and glued them on with Aleene’s Tacky Glue. My wig came from Amazon. I couldn’t believe the reaction!! We wore these costumes out on a trial run to our downtown Halloween festival and people were going CRAZY. As we were walking through the parking lot, little kids were already starting to point and squeal from across the street. All night long parents, teenagers and kids alike were asking to take photos with us. We got random hugs from toddlers. Even professional photographers were snapping candid shots of us with other people in costume. My favorite thing was when we photobombed a sweet family’s group shot. Because when they turned around to see our Inside Out costumes, the little kids were all laughing and dancing around. They showed us the picture after, and even I laughed! It was really really awesome. For another really cool Anger idea, you must check out this unbelievable costume here. Homemade costume idea posted by Haley L.